Neville Pepper Shirts in white only. Adult Sizes S/M/L/XL. Youth Sizes S/M/L/XL. Nevillizms Volleyball Coaching Shirts in colors shown below. All Nevillizms shirts only Adult Sizing S/M/L/XL, other than 2 of the lighter pink shirts which are missing some of the sizes. ALL Shirts are SHORT SLEEVED ONLY. 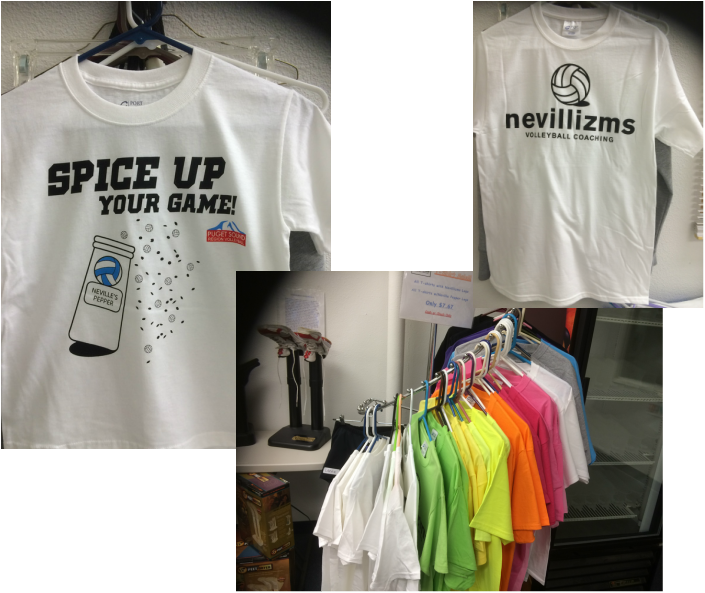 Colors of Nevillizms Volleyball Coaching Shirts: White, Lime Green, Yellow, ER Green (Highlighter,) Orange, Dark Pink, Medium Pink, Light Pink, Gray, Aqua Blue, Purple and Black.